WHEN DID YOU LAST SPEAK TO BABA? One of my thoughts this month has been - KEEP TRUSTING DADDY. Living in Tanzania has been such a beautiful lesson in TRUSTING GOD. People do not consider themselves poor, or underprivileged, in fact, lives are full of joy and contentment in the present moment. If a need arises it is the most natural thing to call on Baba (Father God). It is my prayer that this beautiful oasis-Karibu Nyumbani- that the Lord has built in the last 5 years will be a place where all our children will call on Baba, all those who come to visit, learn to Trust Father God, and all who live around us call on Him. Whatever challenges you are facing now, I pray you will can “Be still and Know that He is God” and rest in His loving care- He never fails. A few weeks ago, Sarah gave birth to a healthy calf and she is well and giving plenty of milk!!! Milk sales have doubled! Thank you so much for your prayers. 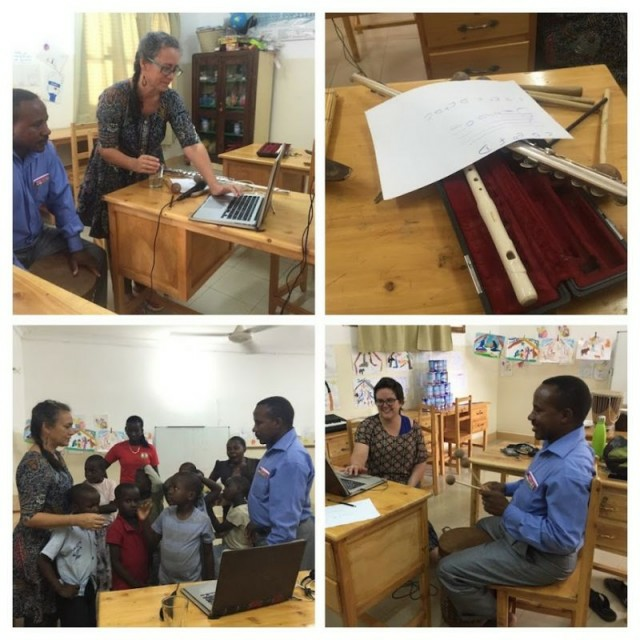 A few months ago, we had a gift from the President of Tanzania! He decided to give some food to the Social Services and we were chosen as the Orphanage in our area to receive some rice, and maize and a goat. Ester said we shouldn’t slaughter the goat- and lo and behold she gave birth to twins!! Thank you Magufuli! By the way we have called our goat Magufuli! Our chapel is growing! We have had some very encouraging comments from people in the village saying how they want to join us for prayer in the evening. Adjoining the Chapel, a “Water tower” has been especially built to hold all the water for Royston house, and any new houses we may want to build in the future! Under the tower will be a sacristy, toilet and hallway into the Chapel. Early Rains Bring Wall Down! Early one morning a few weeks ago, we were woken up with the news that our wall had fallen. With every challenge comes with it a need to trust God more, and on this day, peace rested in my heart, knowing that Our God knows everything. We had had constant rain for about 3 days and since we are on a hill, and our wall is in a valley, the rains came like a river through the place and beat the wall. We will need to rebuild it as soon as possible because of the increase of theft in the village. We have had advise to ensure that it will not happen again however the cost is going to be higher than we can afford. WE ARE ASKING FOR HELP TO REBUILD THE WALL AND PRAYER FOR OUR SAFETY WHILST IT IS DOWN. Last night we heard that 2 men were killed after trying to steal a motor bike, they were stoned and burned. Village life here is not quite like the cosy villages I am used to in England where you can leave your doors open! You won’t believe this but one of our largest bills is our water bill. But when the rains come we turn off the mains water pipe and allow the rain to fill up our “kisima” -Water container. When the rains fall, our crops grow for free, if you plant them of course! We have had a wonderful harvest this season and our freezer is full of tomatoes, peppers and aubergines! It’s not so easy to get in and out of Tanzania if you want to stay more than the initial 3 months visitors allowance. So, Ludmila and I, have since last year needed to do extra work getting a work permit as well as visa and we had a surprise visit from the Immigration office as they wanted to see if we really existed!! For the last 5 years we have had the blessing of having Caritas Volunteers for 10 months at a time, and they come well trained to volunteer and speaking Swahili. This year we have heard that there will no longer be any more Caritas Volunteers, and one of the leaders who has brought volunteers into Tanzania for the last 10 years came to see us to say good bye!! Brigitte who has become a great friend of us all here visited for a few days- she particularly thanks Ester as she was very involved with looking after the 30 volunteers coming over from Germany each year. Brigitte recently writes! Oktober 2017 was my 5th visit in Karibu Nyumbani. The physical development is mind-blowing. I did enjoy living in the new guesthouse. The yard is paved, which looks beautiful and cuts down the work as it is reducing the dust in the houses tremendously. AND now the new chapel gets built. I admire the three mamas and how they struggle with the local circumstances, finding the cheapest builders and keeping their joy for the work alive, finding good and cheap material for the buildings and running for a new screw or pipe which is needed. By now they are halfway experts, I also can see their tireless efforts. As a German (always critical) I asked myself if the outward is growing too rapidly, what is with the inside. But I just can testify it has grown the same way. The unity and love between the three Mamas has grown very stable and deeply over the last years. It is a joy to experience it and to be together with them. I can see Gods love present in their relationships. And for sure it is not always easy coming from three different cultures and backgrounds. But thinking of Karibu Nyumbani is my greatest deepest joy, that I can just testify that it has become a “home” for all the children and workers and visitors. But first of all, to the children. Knowing the children now for five years, I can really see, they are loved, and feel loved and behave loved. Karibu Nyumbani is their home and they move freely through all the rooms and places. It is such a sweet picture how the little ones bustle about Mama Mia in her tailoring workshop, and learn how to sew their own dolls. It is a great privilege for the children to be with Mama Pipi in her office and draw a picture, while she is working, they feel very important. And to be with mama Ester while she is organizing things you see the self-esteem of the children rising. If I see the children of Karibu Nyumbani I do see no orphans but loved and wanted children. How wonderful! I could go on and on, but let me write one more sentence about all the Uncles and Aunties which are working very diligently in Karibu Nyumbani. Karibu is also their home, they are receiving much more care and love as would be given or received in a European work relationship. They are in reality one big and loved family, by Fiona, Ester and Ludmilla at first, but behind that you see the love of our saviour Jesus Christ ! We had a request from a musician, if he could video our children singing with him. He had written a song about Orphans in Tanzania. Our children loved the day and entered-in very happy to think that they could help other more disadvantaged children. ZLATICA- is no longer a visitor! 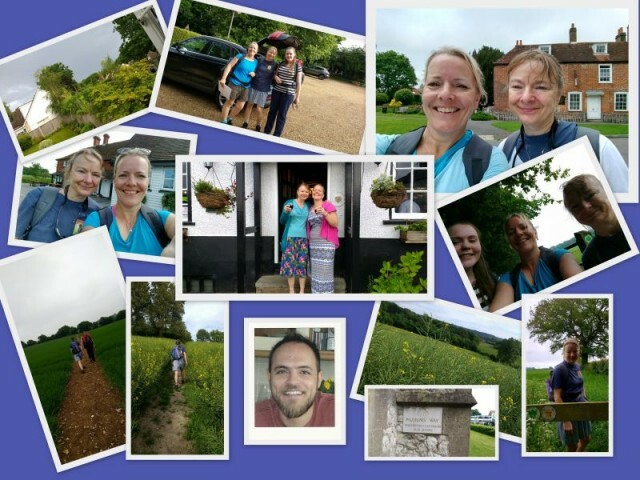 Back in March, my sister Clare came up with the fantastic idea of doing a sponsored walk to raise funds for the volunteer house at Karibu Nyumbani. I had to get fit , as her idea of a fun holiday is to climb up mountains in the Himalayas . I feel blessed having this time to enjoy the beautiful countryside that God has created. A young person ,Christina, from our parish also joined us for the walk. Our walk took place on Saturday May 27th. We woke up on the morning of the walk to a thunderstorm. Thankfully by the time we reached our start point, it had stopped raining, although that didn't stop us getting our wet feet! Our 25 walk started at Alresford and finished in Farnham , following the St Swithun's way. Christina unfortunately got a migraine and had to leave us half way. The sun cam out in the afternoon, although didn't help dry my feet at all. We had a few tricky bits in the walk, trying to follow the route and did a dance and a shrill ululation, African style every time we managed to find a way marker. We arrived at the Royal Oak pub after 10 hours of walking, and after a shower and soak of feet were able to enjoy a well deserved glass of wine. Thank you to all who donated on our page on line. http://www.goldengiving.com/f/taking-steps-for-Karibu-Nyumbani where we have managed to raised over £4900 , and to our parish who raised £400 in cash, and kept us in their prayers. I would also like to thank the family and friends of Royston Dorsa, for all their donations. Royston sadly died in a tragic accident in Dar es Salaam before he was able to join Karibu Nyumbani as a volunteer and share all his amazing talents. R.I.P Royston. The Writing Of Our Own Song! One of the tasks that Fiona had asked me, if I would like to try and do during my time in Africa was to create a new video updating the one from the website. The Christmas video was my practice for the real one! As we were discussing what music we would use for the video and I was a little uncertain about copyright if we used someone else’s music. This prompted the idea of writing our own song! One afternoon of singing and sharing ideas, I recorded all of Fiona’s thoughts and took this away to create a full length song. We wanted a true African sound so enlisted Roman from Agape, Bupee and Domina, Fiona for her flute and of course the children! Now that I am back in New Zealand I will spend some time piecing together our song, as well as creating the video!! From knowing nothing about videoing and recording before I went to Africa, God definitely provided all aspects of the process to allow me to complete my mission!! Christmas and New Year - Part 2! One of my most common phrases at Karibu Nyumbani was "I have not done that before but I can give it a go"
Blogging and making collages was one such time I used this phrase. I have made another collage of Christmas, such beautiful smiles and showing the magic through the eyes of the children, but I cannot work out how to put them together. So this is part two! It was a very special week over Christmas, with the children being on holiday and everyone getting a little time away from their daily routines. Coming from New Zealand it was very normal for me to have a hot Christmas, but I know very different for the Northern Hemisphere people at Karibu Nyumbani. What was new for me, was the tradition of going to Mass Christmas Eve and opening presents afterwards together with cake and soda! Looking back, I noticed Christmas become more of a way of life for a few days rather than fitting everything into one day, which I very much enjoyed. There were many visitors over this time bringing presents and treats for the children and this created a lovely sense of community and excitement. Ludmila and her sewing ladies made the children a new dress, shirt and pants. The girls were also given beautiful wigs with beads and the boys received each a Masai blanket. The glee and joy coming from the children as they opened these were priceless and everyone looked very smart attending church on Christmas Eve! 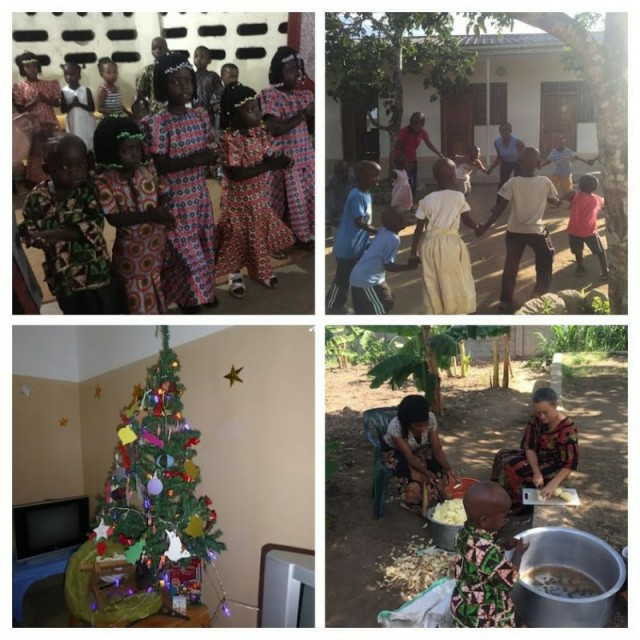 Christmas Day was lovely and slow and time was spent together in the morning peeling potatoes for the favourite of Tanzania, “Chicken and Chips with Soda”. The afternoon was spent down at the playground relaxing and the girls had their finger nails painted. Between Christmas and New Year everything was definitely in holiday mode at Karibu Nyumbani. The children enjoyed staying up late and watching movies, and so did the Aunties and Uncles. The gift of just spending time together and being thankful for the birth of Jesus will be something I will remember for a very long time. In August & September 2016, I was fortunate to visit my birth country Tanzania. Where can I start to tell you about my visit this summer? I guess I should start by first telling you how my heart is filled with admiration for Karibu Nyumbani ophans as well as its co-founders. Who I saw as good examples of God’s many miracles. I do regret that my visit to them was brief. However, after spending time at the orphanage, it was obvious that I will be returning there. The orphanage first impression, has left a warm, tagging and lasting memories in me that I will forever be drawn back there to see and support them. The warm welcome that even Sarah, my 6 yrs old daughter felt from the children left her with lasting memories and lessons no mother or school could have ever enforced better! The orphanage made all of us feel so welcome and at home. The happiness and acceptance from the children left me feeling loved unconditionally. I keep praying for continuous revelation from God on what he wants me to do to support his wonderful work there. As the visit made it clear that without the support and generous contributions the project receives– whether through volunteer’s time, financial donations, fundraising or emotional support and prayers it won’t be possible to sustain it. Since my return I have done nothing but think about my visit. I feel like a piece of me remained at the orphanage. After weeks of prayers and personal reflection, it’s clear that my task is to get my local community, friends, family and university to join forces with Karibu Nyumbani and make a huge difference in the lives of the children living there even if it’s just helping them spread the word of the work they do or the support they need. 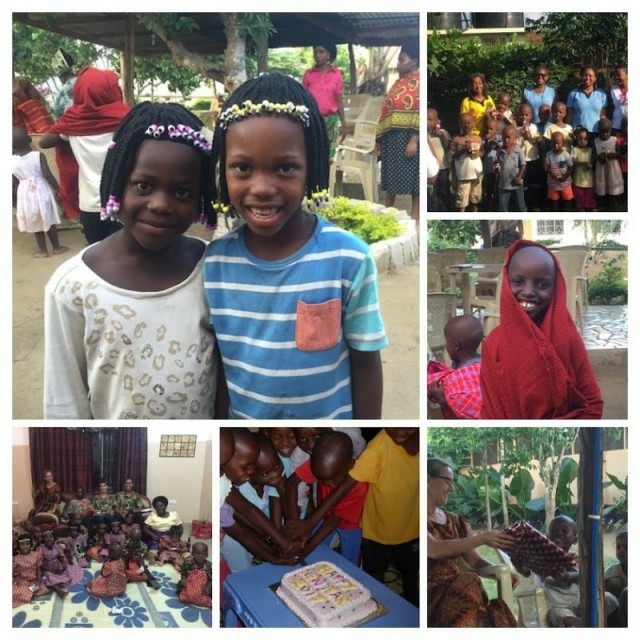 It’s not a secret the orphanage has already given a small group of Tanzanian highly vulnerable children the chance to a bright new life. A life based on care and Gods love, healthy bodies, and minds crammed with knowledge and excitement. I truly do hope I can find purpose in my own life by helping children in desperate need for support. The co-founders- Fiona Hendy, Mama Easter and the other ladies working at the orphanage have given up their lives selflessly to help the children daily needs. However, they can’t do this job alone! 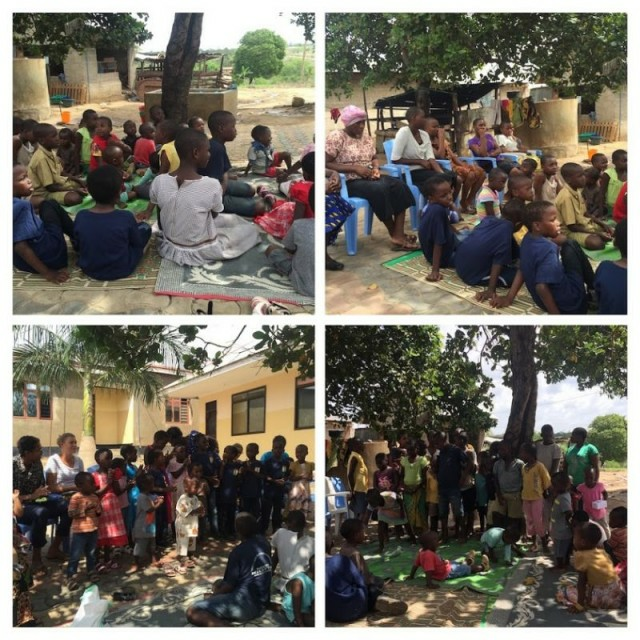 They need volunteers to go there and help with the children, they also need financial donations and fundraising support to keep the project developing to help more children. It’s evident that work already done at Karibu Nyumbani is impressive! The fantastic facilities that the children sleep in, live, eat and play are clean and safe. The future need is now a decent school for them. From the many generosities extended to them combined by hard work invested by Fiona and Ester - A new plot has been purchased and they are looking for support building a small school for the children. the new school that will not only educate orphans but hopefully open its doors to children at the nearby village. I believe this is a fantastic vision. One that needs prayer support and fundraising. Please I urge you if you have never considered supporting a worthily cause. I urge you to consider Karibu Nyumbani orphans to be the benefactor of your kind charity….